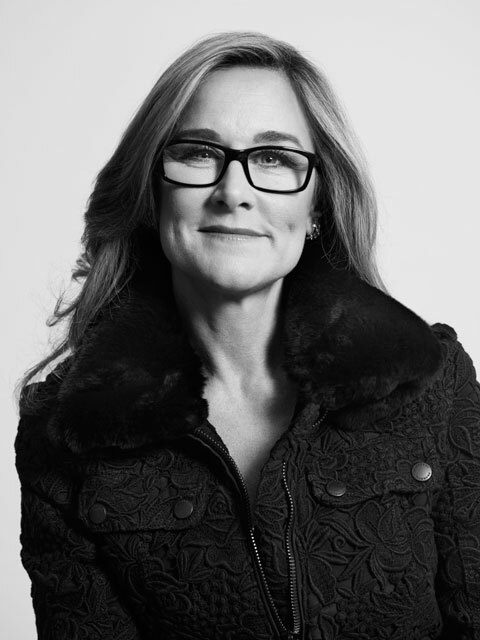 At the intersection of fashion and technology, is retail chief Angela Ahrendts Apple’s next CEO? The magical halo that surrounds Apple hasn’t gone — just yet, anyway. Otherwise, it would be hard to explain why chief executives of luxury brands leave their lush and (somewhat) glamorous lives to come work for Apple. First it was Yves Saint Laurent CEO Paul Deneve who left the fashion house to become chief of special projects reporting to Apple CEO Tim Cook. And today, Apple announced that Angela Ahrendts, CEO of Burberry, is joining the company as senior vice president. By all means, this is an inspired choice for Apple. The Cupertino-based company has been a bit directionless in terms of retail operations since Ron Johnson left to become the CEO of JC Penny (where he was later nudged out.) He was replaced by John Browett, CEO of U.K. retail chain Dixons & Tesco.com. He turned out to be a colossal disaster. He was fired in October 2012 and since then the company has been without a retail chief. It has started to show in earnings results — average store revenues were down to $10.1 million in Q3 of 2013 (when Apple had 405 stores) versus $11.1 million in Q3 2012 (with 367 stores.) During Q3 2013 overall retail sales were $4.074 billion versus Q3 2012 sales of $4.084 billion. Even scarier is the decline in retail profits: $667 million in Q3 2013 versus $868 million in Q3 2012. Ahrendts seems to be an ideal fit for the job; she has a long history in the retail business. Born in New Palestine, Indiana, she is the third of six children. Her mother was a fashion model, and she fell in love with fashion early. She attended Ball State University and graduated in 1981 with a Bachelor of Arts degree in Merchandising and Marketing. She then started working her way up the retail ladder. She was president of Donna Karan International in 1989, later joining Henri Bendel as executive vice president and joining Liz Clairborne, where she helped nurture startups like Juicy Couture and Lucky Jeans. A mother of three, Ahrendts joined Burberry in 2006 and the stock has surged almost 250 percent, with the company becoming a $3 billion a year fashion colossus with 530 stores. Of course, it helped that she caught the luxury goods wave early and rode it to the top. But a slowing global economy has hit Burberry hard. The ruthless expansion of the brand into four corners of the world, plus declining quality, has reduced Burberry’s stature. I personally think (and I might be alone) of it as an overpriced Banana Republic; the exact opposite of luxury concepts. That said, Ahrendts did one thing that all her peers in the fashion business didn’t do and still have not been able to grok: she embraced technology wholeheartedly. Burberry became an early adopter of whatever new cool thing that came around — it was an early convert to the potential of Instagram, for example. But more importantly, it weaved digital into its entire business processes, making Facebook, Twitter and Google as much a part of its growth strategy as advertising in the glossy magazines. Now, everybody is a digital customer, so doing things digitally is no longer a niche [play]. Doing things digitally is how the entire world communicates. That’s our language today. Digital is not an afterthought. Our design teams design for a landing page and the landing page dictates what the store windows will look like, not the other way round. In creative media, they’re shooting for digital, then we are turning it back to physical. We knew every pound we spent digitally, we could potentially get ten times the reach that we could get physically. For a few years now I have been talking to friends who worked with or at Burberry and they all shared little details about how the company worked. In fact, I was so impressed with what I heard that I tried to find a way to get Ahrendts to speak at our RoadMap Conference, but navigating fashion company PR offices is a blood-pressure raising exercise. That’s probably not going to happen anytime soon now that she is gone into the great Apple abyss, where executives are not allowed to talk to media or appear at conferences. Ahrendts understands the luxury and upmarket retail intuitively and will be able to find new ways to revitalize and rejuvenate Apple stores. She can balance operational efficiency with art in a retail experience. She will help Apple expand in China, where she has a lot of experience as Burberry CEO: they were the first ones to drive Burberry into the lesser known Chinese cities. She knows online retail and importance of digital quite intimately. While it is easy to go from a few hundred million dollars in sales to $3 billion (like she did at Burberry), growing a $21 billion+ a year business with 405 stores isn’t easy. Unlike Burberry, Apple stores serve a diverse set of customers who buy a diverse set of products and have a diverse set of expectations from the brand and customer service. It is fashionable to think that CEOs are superheros who come up with all winning strategies, but the fact is that CEOs make decisions and you need a team to provide you the smart and eclectic inputs to act upon. How will Ahrendts do without the digital team at Burberry? I have said it before and I will say it again: Apple doesn’t really have the internet gene, and it shows up time and again in how its products intersect with the internet and online services. A lot of that has to do with Apple’s culture. Apple is a company that is notoriously closed and insular in terms of ideas, both adopting and adapting to them; just look at Apple’s presence on social. Burberry under Ahrendts seemed the exact opposite. Apple products and retail stores are about creating a customer experience that keeps customers loyal to the Apple brand at a time when the company is under incessant attack from the Androids. Maintaining that loyalty and experience — turning that brand into a customer’s digital destiny — and yet keeping the profitability growing is a challenge. Ahrendts comes to Apple at a unique moment in time. While the world is focused on the transition from old fashioned personal computers to pocketable internet devices and tablets, the real shift is going to come in next three to five years. We are going to see the rise of what is going to be called “intimate computing,” where devices on our bodies will be held together wirelessly by a smartphone, thus creating a computing fabric. As the early experiments have shown, these intimate machines have to be a lot more human than, say, Google Glass. My dear friend Christian Lindholm, who worked for a long time on user interfaces for Nokia and later as the chief innovation officer of design agency Fjord, believes that intimate computing is a world of fashion and personality and personal flair. He currently is CEO & co-Founder of KoruLab, a wearable operating software platform company. One of the main reasons why we have not seen any devices become popular on the scale of the iPod or iPhone is because they lack that fashionability. This transition to computing jewelry is going to be made possible by emergence of curved screens (recently announced by both Samsung and LG) and new magical materials. Apple spends a lot of time researching those two areas and it wouldn’t surprise me to see them craft new intimate computing devices, especially now that they have hired Ben Shaffer, a designer who worked on Nike’s wearable devices. This new intimate computing era means that Apple has to stop thinking like a computer company and more like a fashion accessory maker whose stock in trade is not just great design but aspirational experience. And it has to do that at price points that are not quite luxury, which is going to be the challenge. The fact that Cook brought in YSL’s Paul Deneve tells me that the company is already thinking about the intimate computing future. I look at the future and can’t but help think that Ahrendts could be the inheritor to the CEO throne. She has operational experience, she understands fashion and fashionability and is a classic combination of left-and-right brain that Apple seems to adore. That said, I think the biggest challenge and perhaps one that could prove to be her Achilles heel has less to do with her capabilities and more to do with how Apple works. First, she is not Ron Johnson. And she is definitely not John Browett Brownett. She is Angela Ahrendts, and she is a rock star. She hobnobs with rock stars, hangs out with models and graces the covers of magazines. She is the personification of a media celebrity CEO. She is a woman who seems to have it all. She is used to being the center of attention and being able to access reporters and give interviews. She is not the nameless, faceless functionary that Apple loves and makes sure that they remain anonymous. The time she will spend at Apple will tell a lot about the company. The post-Steve Jobs Apple, despite Tim Cook’s assurances, still works like Apple in Steve Jobs’ day: secretive, controlling and making sure that the message of the company is airbrushed. How will she deal with playing second fiddle to working for Cook and Jony Ive, the only two people from Apple who are deemed to be stars representing Apple? Can Apple change its culture to adapt to Ahrendts or will Ahrendts change to become Apple’s functionary? That is the real question. If Apple changes, then you are looking at the next Apple chief executive, one who can take the company in a different direction. And that’s why she is an inspired choice: one that could help change Apple itself. And now a personal message: I am hosting GigaOM RoadMap, an experience design conference with Katie Fehrenbacher on November 5th and 6th in San Francisco. I would love for you to join the two of us and we’ll have experts like Jack Dorsey (of Square and Twitter) and Kevin Systrom along with many more speakers tell us the role of design in our increasingly digital society. For details, visit the conference website. Rich doesn’t always mean government printed Currency Dan. A tour de force, Om. Worth re-reading, reflecting upon in the light of confrontation with Apple’s competitors in the same markets. And this is when I stopped reading. I happen to think that Apple is gearing up to open a significantly large second line of business (large enough to justify developing a sub-brand even) on the high fashion-high tech front, where both facets are equally important, not one subordinated to the other. Apple is the only company in the world that has the chops and the brand cachet to do this. Because of their design expertise, they are equally credible in the tech and fashion industries. I’m thinking Swatch kicked two notches upmarket, with product tie-ins with the major fashion houses, such as a smart watch model designed by House Versace. Things like that. What makes this particularly attractive for Apple is for once, they are able to go to where Microsoft, Google, Samsung, or anyone else cannot follow them. Nope, those guys reek to much of Eau de Geek. Apple hired Ahrendts to run retail, a much bigger job than running all of Burberry. Speculation that Apple needs a new CEO, or that the tech giant would be best run by a fashion brand executive, is purely absurd nonsense. Apple doesnâ€™t intend to make Ahrendts its CEO any more than it planned to make any other retail hire its CEO. Appleâ€™s core value is primarily its operational expertise. It needs to develop great products and needs excellent marketing and sales, but the person to run Apple is an operations expert, and nobody knows that better than Tim Cook, who has been quietly orchestrating Appleâ€™s operational expertise for well over a decade of incredible growth. Even suggesting that Apple needs a new CEO or that it is serious thinking of promoting a retail expert to lead all facets of the worldâ€™s most successful and efficient profit engine is mind-blowingly moronic even to suggest as click bait chatter. It is always delightful to be labelled a moron. Adds a special level of satisfaction as a writer. If you read the article and not skimmed it (I am assuming like you assumed that my view is moronic) you would see that it is a guess as to her being a future ceo candidate as apple moves into a newer category. As a lifestyle brand, apple will need a retail expertise CEO. As I said, this is not today or tomorrow or even next year. But eventually Tim Cook will retire and when that happens a slew of candidates are going to be up for nomination, and she be a strong candidate. And when that happens, maybe you and I can have a conversation again, which doesn’t start with assumptions of being moronic. Thanks for your comment and time! That was my first thought when I read more about her. Is she the anointed one? Of course not, but if Apple expands into where I think it is expanding (see my comment below), and if things break a certain way, then of course she would be in the running. But that would be years from now. I just think that to lure a proven successful CEO to take on a subordinate role, the job scope and description as well as Apple’s direction as described by Tim must have been too big and exciting to pass up and the potential for advancement (even with nothing said or promised or even hinted at via a raised eyebrow) must have been apparent. I presume she’s sharp enough to figure that out two seconds after Tim rolled out the proposed position chart. I have a hard time believing that’s the real Daniel Eran Dilger from AppleInsider. He is a crazy partisan, but surely he must know the difference between a clickbait artist and the great Om Malik. While I disagree with Om on some of the above points, he is definitely not a moron. However, I do think it is fairly easy when ones opinions face no real world consequences to share what one thinks Apple “needs” or doesn’t need to be successful in the future. Clearly they need to improve certain areas, but the greatest manager of all time, Steve Jobs, deferred his baby to Tim Cook… So I’ll defer to Tim Cook. Exactly. It’s ridiculous to claim that Apple has no ‘CEO’ potential in its VP bench and that an external hire for retail will be in the succession chain. Tim’s not going anywhere any time soon and when he does, it’s far more likely that Federighi or Shiller ascend to the top job. I also genuinely hope that Apple continues to keep its entire organization on message and continues to cut the media out. There’s very little upside and a mountain of downside from opening ranks and letting VP’s and other staff ‘off the leash.’ The siege mentality is very important at Apple and they will continue to operate like the underdog for as long as the company still exists. It is ridiculous to claim that I claimed that Apple has no CEO potential candidates. Om, I think you nailed it about inheriting the CEO crown. Tim Cook is a logistical master in every respect, and that extends from equality and diversity on his management team to succession planning when the day Tim passes on the leadership mantle to his successor. There really isn’t a future CEO in the current leadership team at Apple. Ahrendts is the anointed next CEO of Apple. No no no no. I shudder at the thought of her as the next CEO. She may prove fantastic as head of retail, and I hope she will. But please no degree-in-Merchandising-and-Marketing persona for Apple’s CEO. Please please no. Do you know her personally to have such a strong reaction? Question — why not? I wonder if Ahrendts’ “rock star” status will not be a detraction, but rather a key reason Cook chose her to run retail. Unlike the other SVPs, as head of retail, Ahrendts would not be managing secret projects. To the contrary, hers is the most public-facing position in the company. Cook is a fine manager, but unlike Jobs, he is hardly a “rock star” CEO who can sway the masses with sheer charisma. I would not be surprised if Ahrendts is intended to help fill that void. Thanks for your comment. All valid points, but the company’s history is that of giving limited exposure to its employees. I am hopeful that they will change the rules a little bit for her, as she could give them a lift in the marketplace/or give a perception of change. All remains to be seen. Apple is bigger than individuals and i don’t think it needs to mend its ways for one individual no matter how great that person is. What people did in the past and what they accomplished doesn’t matter they have to reset themselves and embrace Apple culture. Apple has its weird ways but after all its designed and built for crazy ones. Coming to Maps and Siri they are data intrinsic more you mine the data better it gets. I agree with you Apple has to learn from maps and siri. But its not that Google got the maps right on day one. I got lost 100% of the times using Google maps in its early days i used to fall back on MapQuest. However, Google got more and more data through its search and maps and mined it properly. Products like maps and siri get better with data and Google gets that through their search. Fortunately i never had problems with Apple maps. First she needs to do a good job as retail and online head before becoming CEO. So glad the cat is out of the bag, so to speak. I mean, it’s long been a sport to slam Apple and its product line as hardly more than fashionista fluff-tech. But with the credible emergence of wearable tech, that sissified corporate image no longer seems a personality flaw, but a central asset. A new large, rich, addressable market seems to await Apple’s pixie dust. Thus, certain writers on technology face a big shift in their job description â€” ditching the now outdated snide put-down vocabulary, wising up about fashion (gasp! ), and trying to grasp how the white horseman managed to pull up alongside their blind spot. Would you ever write something like this about a male executive? Serious question. Is there any article in your past where you said something like this about a man? You are trying to make it a sexist thing. My description, is not about her being a woman – her role demanded her to being the center of attention Burberry didn’t have any rockstar designers like say Marc Jacobs and she was the rock star. She was center stage and center of attention as a result. Come back more often and you will see that I keep it clear and simple, regardless of gender. Burberry serves a more diverse set of customers than you give them credit for. From the chavs on London’s inner city streets in Burberry tartan caps to the celebrities who buy Prorsum looks from the runway. The fact that Burberry under Ahrendts seems the opposite of Apple’s history with social strikes me as more good news, not bad news. “They have nowhere to fall but upwards” is the phrase I have in mind. The fundamental question is: are you right in assuming that Ahrendts the rockstar was an expression of her own genes/memes, or was it a chameleonic expression of the makeup of Burberry itself? Is she a rockstar by nature, or by nurture? Personally, I expect she is more of the latter…”rockstarring” is simply part of the fashion industry, especially of the fashion industry done well. My optimism comes with far less caution than yours. At Apple she will be an expression of chameleonic quietness, but still often the loudest in that quiet room. She’ll fit in, and she’ll also stretch them in necessary ways. As a long time believer in Apple, I welcome your optimism, but I remain cautious, mostly because it is hard to ignore their history. I also believe — after talking to several insiders — that Internet remains a vexing problem for the company. I’m curious by what exactly you mean by “(the) Internet remains a vexing problem for the company (Apple)”. Exactly what problems can you point out to the company that put the Internet in our pockets. And before that, the company that was directly responsible through their innovative products (NeXt) that gave birth to the World Wide Web as we know it today through Tim Berner Lee. Also don’t forget that the iTunes and App Stores are by far the most profitable digital delivery stores in the world for producers and developers. Last but not least, Google still benefits more from iOS users accessing the Internet seamlessly than from Android; and this just in: Facebook ads are almost 2000% more effective on iOS than Android. What exactly would you like to teach Apple about the Internet? Thank you for your comment. While I don’t disagree with any of your comments about the role played by next in the past – but theta was decades ago. Usage of safari browser is what makes google search work and also Facebook ads — but they are not apple products. What I am talking about is company’s ability to bring to life internet native products to life at scale, something companies like amazon and google do quite well. The maps is a debacle that is a reminder that apple doesn’t quite grok services quite well. At scale, they have built one great internet app- iTunes Store and iTunes Match. Even those have challenges. I am working on a post and hopefully will go into greater detail about their challenges that include scaling Siri and building internet into their products. When you fix thatâ€”hit up Gruber to fix the quote on his site. Thanks for catching that error and also emailed Gruber. Eddie, that was a an interesting technical comment and indictment of some sorts. That said, I agree with Om, this was an inspired choice and I really do wonder what the courting was like for Angela to come to Apple. That said, organizations need to infuse their ranks with talent, and at least there seems to be a cohesive vision that wearables are the future. Perhaps Apple with Steve Jobs wouldn’t need to reach outside so aggressively, but with Tim Cooke , it does. An observation that Apple may have jumped the shark … with its flagship iPhone, the 5s Apple is making a fashion statement with the gold and silver options as a *priority* while saving a few pennies by gypping 5s owners on the accelerometer. The 5s accelerometer is a 6-bit Bosch MEMS chip, according to the Chipworks breakdown analysis. However, the iPhone 5 (and 5c? ), 4S and 4 all had 16-bit accelerometers from a different vendor. This really says something about a possible shifting mindset at Apple which is essentially to increase emphasis on the pretty fashion aspects while regressing on the technology (with the added consequence of making Wall St. happy on margins?). Isn’t that the point of the M7 in the 5s? unless your an engineer closely involved w/ the intimate details of the M7 and iphone platform, i dont think youre in any way qualified to even question its bit-rate. also: the gold iphone is the most popular & sought-after iphone in history. not jumping the shark. also: do you remember ipod socks? google them. awful. Why do you want Apple to change its communication style? Its relationship with people is thru its products, not its executives. I’m glad Tim Cook is doubling down on secrecy. No point in talking to journalists anyway, since most of them seem to have drawn their conclusions about Apple already. agreed. Om has a different view than average consumers because he is the media that is seeking the communication for his own product (this site, etc). as a normal consumer im happy as a clam with them executive communication policies. Think of it this way — by being non effective communicators they are facing the challenge of constant misinformation as was the case for past few months which lead to negative chatter which in turn led to stock market negativity which in turn led to a lot of people in the company getting nervous about things. While it is good to hold media accountable as you guys seems to indicate, not being communicative does act as a negative force. Hope I have made myself clear and again appreciate your comments and engagement! Om, I like you articles but in this case i have to disagree with you. The new generation which started at Apple may think about its stock price and wall street but many of the folks who worked under SJ, we hardly looked at our stock or wall street. I will be really disappointed if Apple starts to work just to please wall street or media. Your points has its own merits but stock price is not always a testament to com pan’s performance. Classic example would be your favorite company Yahoo! – stock has gone up more than 100% but they have failed to release a single meaningful product. Apple doesn’t need to change its culture just to please wall street, media and journalists. we don’t want fragmented comments from Apple executives rather as customer i prefer singular tone from Apple. Thanks for your comment and glad to see a well reasoned viewpoint that is in disagreement with my take. Thanks for sharing. If Apple starts opening up their communication style, there will invariably be a bunch of media reports about how that it’s a sign of insecurity (and they’d probably be right). It’s tough being on top. Whatever they do or say there will be slings and arrows and doubt and nervous Wall Street investors (are they ever not nervous?). It’s like being a political leader: anything you say or do is going to be criticized by the opposing party as being weak or dumb or whatever. If Apple opens up their communication style, there will invariably be a bunch of reports saying it reflects their insecurity (and they’d probably be right). Apple should focus on mastering the internet as they’ve mastered materials and form factors. Word of mouth about crappy Maps or Messages are far more damaging than what some no-name from Forbes or Bloomberg or WSJ says about Apple’s lack of “innovation”. Oops. Your comments section flustered my iPad. Thought I had to rewrite my post. Sorry. Jobs did most of the presentation. His health declined and suddenly we were seeing more of Schiller and Forstall. Craig Federighi is a budding star. I think the new Apple “is” opening up. Schiller is on Twitter and things are becoming more of an Ensemble Cast. I think Angela Ahrendts is going to fit in here nicely. Her business savvy, personal moxie and good looks should be a nice fit with the mix of Apple. Excited to see what kind of impact she can make. I think Apple Stores are in need of some remaking. I am not sure how close you are to the company, but I follow them and can categorically tell you that they are closed as ever. It is impossible to get any clarification or detail, forget about access to executives, especially if you are not one of the pre-approved people who is willing to airbrush the warts. I am hopeful that she is a great leader of change and make company realize its place in the world. I am cautiously optimistic, but you know what they say, you can’t really turn a dog’s tail into a rod. As an ex-Apple employee worked from 2000-2007 i personally don’t want Apple to change its culture. Even though it is a closed culture i cherish every bit of it and that allowed us to focus and innovate. Open world has too much noise and distracts Apple and its people. Don’t forget this very culture has produced three revolutionary products that changed the course of digital industry. Open world may have better benefits but believe me Apple doesn’t need it. “JC Penny” -> “JC Penney”. 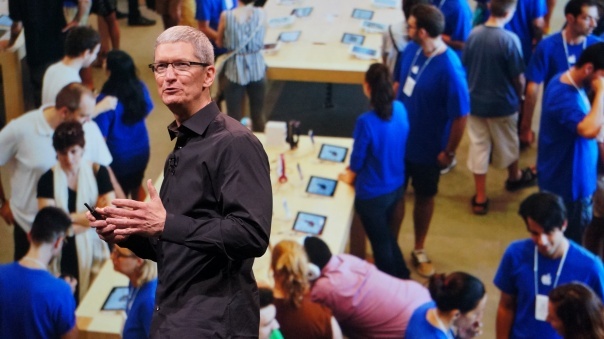 Despite Tim Cook’s assurances, Apple is still Apple? He assures that very fact, not the opposite. Is that a typo? Tim Cook doesn’t want to change Apple’s culture, and he’s not going to allow some outsider to do that. He’s been pretty charitable about giving screen time to other executives (not only Jony Ive, but Craig Federighi, and Phil Schiller). He may very well allow Angela more leeway, especially as Apple’s wearables start rolling out. Retail was built for such releases, and probably even more so for wearable computing jewelry. This doesn’t change Apple’s DNA.